RUAG AEROSPACE and ADVANCED AVIATION LOGISTIC had tested the first 5 blade composite Propeller for D 228 Series, developed by Muehlbauer / MT Propeller Germany. 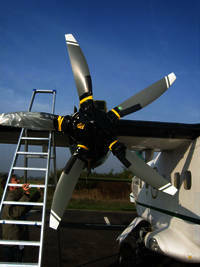 The D 228 - 202 K SN 8159 D-CAAW and SN 8152 D-CAAL are the first D 228 aircrafts fitted with this outstanding propellers. Since July 2007 is the D-CAAL flying for NGO`s without any problems in Centralafrica! 100 LBS less fuel consumption per engine and flight hour - so the range increases up to 1500 NM! Interested...? Contact us for more information and/or please check with RUAG AEROSPACE / and click MT- Propeller via Links and Friends for more information!